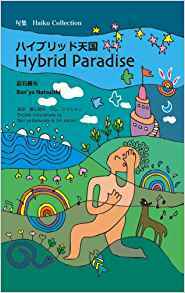 Hybrid Paradise ハイブリッド天国 (ISBN 978-81-8253-175-8) is the third major poetry collection by noted Japanese haiku author NATSUISHI Ban'ya 夏石 番矢that has been printed by the Indian publishing house Cyberwit.net (http://cyberwit.net/). Following the 2007 and 2008 releases Endless Helix 無限の螺旋 (ISBN 978-81-8253-072-0) and Flying Pope 空飛ぶ法王 (ISBN 978-81-8253-106-2) it boasts 134 pages, eleven chapters, and a staggering total of precisely 240 haiku. Hybrid Paradise is by no means a work of mere quantity though, as is already indicated by the individuals involved. The cover design has been provided by the Japanese poet and haiga artist Shimizu Kuniharu 清水 国治; it fittingly emits a strangely familiar vibe, just as as many of the book's poems. The American haijin Jim KACIAN, who many will recognize as the founder of Red Moon Press, has had his hands in the English translations provided to complement the original Japanesehaiku. Finally, NATSUISHI Ban'ya, the author himself, is a professor at Meiji University 明治大学, co-founder and director of the World Haiku Association 世界俳句協会, as well as the president of Ginyu Press 吟遊社. Hybrid Paradise does not rely on any fixed meter, on references to the seasons, or the somewhat archaic language that is classically associated with haiku. Thus, the boundaries of the genre are pushed to create modern, international, sometimes very intimate, often grand poetry that is demanding in the way masterful art often is. In his own way true to tradition, NATSUISHI Ban'ya employes but a few words in this example (p. 42) to describe not only a scene from his life as an artist but also to open his personal experience up to more universal interpretations. While possibly cryptic at first glance, the poem soon tells of a poetry reading that was also attended by someone who could play the morin khuur, the Mongolian “horse head fiddle”. Genghis Khan then does not only serve as a source of grandeur and as a signifier of internationalism but can also be read in an even broader context, as code for political and military power for example, which might be seen as standing in contrast tohaiku as a representative of the fine arts. Any possible interpretation in this vein again begs the question why it really only is a horse of the great Mongol leader rather than the Khan himself which “follows a haiku”. The potential for reflections seems almost limitless. To use his own words, the haiku collected in Hybrid Paradise are like gold coins that NATSUISHI Ban'ya has dug up with his poetic senses from the mud of the physical world and versified to be read and to be heard by anybody who so chooses to do (p. 72).